The Consulate General held a literary evening with Nikola Moravcevic, the greatest contemporary Serbian writer of historical novels. 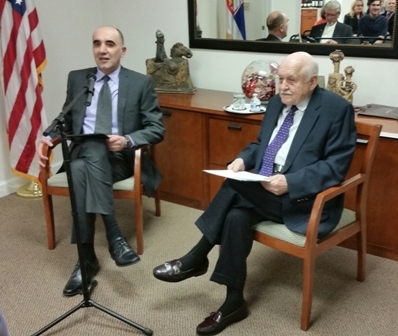 In his guest introduction, Acting Consul General Dejan Radulovic expressed the pleasure of the Consulate General which in this way wanted to express the respect and recognition of professor and writer Nikola Moravcevic for his contribution to Serbian literature. Nikola Moravcevic’s literary opus includes fifteen books or novels, of which twelve are historical. Nikola Moravcevic spoke about the development of the literary form of historical novel in the world as well as in Serbia. Professor Moravcevic introduced the topics covered in his historical novels. He responded to the questions of the audience, relating mostly to the creative process and the system of collecting the material and information required for the writing of historical novels. Member of the Serbian Theater in Chicago, Vesna Zafirovski, read the selected passages from the novels “Vitez u doba zla” (‘Knight in the time of evil’) and “Grof Sava Vladislavic” (‘Earl Sava Vladislavic’). Nikola Moravcevic resides in the United States, in Chicago since 1955. He is the founder of the Slavic Department at the University of Illinois, where he was a Professor, Vice-Chancellor of the University and the Director of Administration for the University development. He is an honorary Doctor of the Wroclaw University in Poland; winner of many awards and recognitions, such as the award “Rastko Petrovic” for his lifetime achievement in 2010, and the award “Janko Veselinovic” for the best historical novel in 2016. This evening the Consulate General also displayed graphics and painting from the art studio Bokiki ART from Chicago (Irena Vujanovic and Bojan Jovanovic). Among the displayed artwork was a graphic which the authors exhibited at the Autumn Art Salon in Paris, in October of 2016. The gallery of photographs is available here.